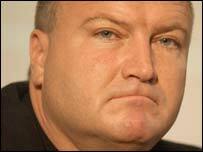 BBC NEWS | Business | Bob Crow: workers' friend? To his many critics, Bob Crow is an unwanted throwback to the worst excesses of 1970s union militancy. A former card-carrying communist who delights in bringing the London Underground to a standstill for the most spurious of reasons. To his supporters, however, Mr Crow - the 46-year-old leader of the Rail, Maritime and Transport Union (RMT) - is simply a resolute defender of workers' rights. Back in the headlines after this week's strike by more than 2,000 RMT workers on the London Underground, Mr Crow and his union called the dispute off early after they said they had secured the written assurances they were after. Yet the RMT added that further strike action may still go ahead next week. The fact that RMT workers walked out in the first place indicates the continuing militancy of the union under Mr Crow's leadership. Their dispute centres on the future job security and pension provision of workers at Metronet, the private company - now in administration - which in 2003 won the contract to carry out the maintenance work on a number of tube lines. When Metronet went into administration in July, the RMT together with fellow affected unions, TSSA (Transport Salaried Staffs' Association) and Unite, sought reassurances on jobs and pensions from the administrators. After talks also involving London Underground managers and Mayor of London Ken Livingstone, TSSA and Unite both said they had got the assurances they needed. Only RMT disagreed, calling this week's strike action. "This must be the first time in history of a union going on strike when everyone has acceded to their demands," he said. Mr Livingstone added that he could not "explain the mindset" of the RMT. But from Mr Crow's perspective, the strike was necessary to get the extra reassurance his members needed. After all, he pointed out, his members now had written guarantees "which is rather different than promises from a man in an expensive suit". Then again, however, neither Mr Crow nor the RMT have ruled out a further three-day strike next week, pending the outcome of further talks. Despite the ongoing indications of militancy, there is one area where Mr Crow appears to be softening: sympathy for Londoners affected by tube strikes. At the last big RMT-led walkout in 2004, Mr Crow was resolutely unapologetic. "I'm not one of those union officials who continually say they regret the inconvenience caused by industrial action," he said. "You cannot have a dispute without inconvenience to the travelling public." It might be little consolation to those put out by this week's strike, but Mr Crow has now softened his line on sympathy for the public. "We apologise sincerely, but we've only got two options - we accept the promises made to us six years ago that have been broken, or we do something about it," he said earlier this week. Mr Crow was elected general secretary of the RMT in 2002 following the death of former leader Jimmy Knapp. The appointment marked the culmination of a career spent living and breathing union politics. Born in Wapping, London, and educated at Kingswood High School, in Hainault, Mr Crow joined the union as a young man before swiftly moving through the ranks. He continues to be very popular among members: over the last five years RMT membership has increased by more than a third to 73,000. While still small by union standards, it is one of the fastest growing. RMT members may hold Mr Crow in great esteem, but he is certainly not liked by the Labour government, which has historically branded him "a wrecker". 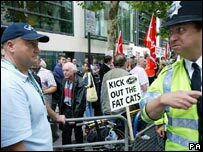 Back in 2004 his hostility to the Labour came to a head when the RMT broke its ties with the party - a link which dated back to 1899 - following a row over the RMT's decision to allow local branches to affiliate with other parties. Mr Crow said he was standing up for the democratic rights of his members. "We don't accept threats from an employer and we're not going to accept one from the Labour Party", he said at the time. Around the same time Mr Livingstone called for RMT members to cross their own picket lines. A few years back Mr Crow also became embroiled in a row over cronyism after his wife, Nicola Hoarau, was appointed by the RMT to set up a credit union for members. Mr Crow was on the panel which interviewed her. However, the RMT boss is capable of less serious skirmishes with the political establishment. In 2003, he was stopped by security guards at the Houses of Parliament after inadvertently trying to enter the building with a 10-inch sword in his bag. The ornamental weapon was a gift from the South Korean rail union. Mr Crow told BBC News Interactive that if he had been planning an uprising, he would have given some advance notice.